A big optics win for Trump; Ford halts production on its most popular brand; More from AT&T, Novartis on Cohen payments. 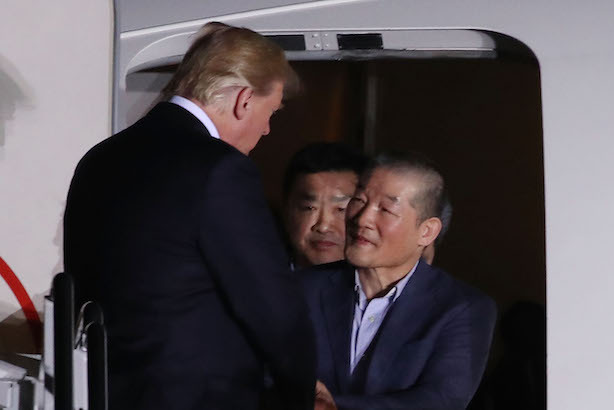 This morning’s big news: President Donald Trump and Vice President Mike Pence greeted three Americans returning from North Korea early this morning in a highly choreographed ceremony in Maryland (USA Today). Trump thanked North Korean leader Kim Jong Un (Reuters). Pence is making the rounds on the morning network talk shows to tout the handover. Ford Motor has temporarily halted production on one of its most popular brands. A fire at a supplier has forced the automaker to pause making the F-150 truck, its best-selling and most profitable vehicle (CNBC). Morgan Stanley analysts said earlier this year that the F-150 franchise is worth more than Ford as a whole (CNBC). AT&T said in a statement on Wednesday night that it was contacted by Special Counsel Robert Mueller’s office late last year about payments it made to Trump lawyer Michael Cohen and "cooperated fully." The telecommunications giant said Cohen did no legal or lobbying activities on its behalf. Novartis also revealed on Wednesday that it paid Cohen $1.2 million even after determining he wouldn’t be able to help with healthcare policy as promised (Bloomberg). Uber CEO Dara Khosrowshahi is hoping for a timeline of months, not years, to resume testing autonomous vehicles. The company halted its fleet of self-driving cars after a fatal crash in Arizona in March. Uber is awaiting the release of a report by the National Traffic Safety Board before it puts autonomous vehicles back on the road (The Verge). The Diversity Distinction in PR Awards is open for nominations. It’s the eighth year PRWeek is presenting the awards in conjunction with the PR Council. Categories include Best PR Firm Diversity Initiative for large and small agencies, Diversity Champion for agency and in-house professionals, and Best In-House Diversity Initiative.